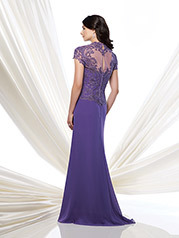 Chiffon A-line gown with lace Queen Anne neckline and short sleeves, hand-beaded lace bodice with asymmetrical waist and illusion and lace keyhole back, side draped skirt accented with lace, sweep train, suitable for the mother of the bride and the mother of the groom. Matching shawl included. As shown in Light Purple: Embellish by David Tutera earring style Kelsey and ring style Claire sold separately. 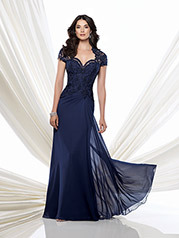 As shown in Navy Blue and Dark Aqua: Embellish by David Tutera earring style Kelsey and bracelet style Juliana.